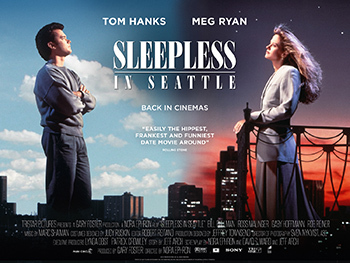 Sleepless in Seattle – 25th Anniversary! This film is a part of a Double Feature with You’ve Got Mail. When two movies that are screening in the same theatre are grouped under the same thematic heading, one ticket is good for both features when viewed back-to-back on the same day (except as noted). Tom Hanks, Meg Ryan, and Bill Pullman. When a boy calls into a radio show to find his widowed father a new girlfriend, he sets one of the definitive modern romantic comedies into motion. Somehow, Nora Ephron persuasively conveys the experience of two characters falling in love despite the fact that they rarely share the screen.